The person who is under drug addiction is left with no sense of responsibility. Once addicted, he continues to abuse drugs for gratification of distorted senses. The family and relations not only remain worried about the welfare of the person but they too suffer emotionally, socially and financially. Things can become more gross if the affected person is also having the financial responsibility of earning and feeding his family. The very dilemma is that the addicted person completely refuses to listen, understand and accept that his life is being destroyed by abusing drugs. Usually, he detaches himself from everything else but the gratification of his demonic hunger. Now, he no more care about what others may think about it, and how the financial and professional matters suffered and suffering, and how his family is suffering socially on account of his weakness to perform. The children are the most vulnerable; people start laughing and making fun. The wife becomes a subject of public entertainment as some people do try to take advantage of the shattered emotional state of mind. The parents fail to understand the reason behind and start cursing themselves. Overall, all the members of the family have to endure all sort of malice and misfortune, just because one responsible member of the family has chosen not to remain Human anymore. Drug addiction facts – vedic astrology overview: Role of vedic astrology is very vital in pre-identification of such combination and placement of planets in a horoscope. The appropriate application of vedic astrology principles can clearly indicate, if a person may become pray to drug abuse in his life or otherwise. The basic factors resulting in drug abuse, as per vedic astrology, are discussed below for favor of information. Drug addiction facts as per vedic astrology – Second house of birth chart: The second house of the horoscope is related with mouth and eating habits, besides many other things. The weakness of the second house lord and affliction over second house may result in intake of alcohol, smoking and other drugs. The influence of malefic and cruel Rahu, Mars and Saturn can deteriorate the habit significantly. Drug addiction facts as per vedic astrology – Sixth house of birth chart: The sixth house of the horoscope is primarily related with the health of a person. Impact of malefic planets over sixth house and its lord may sabotage the health of the native. And, if Moon also becomes weak and afflicted along with troubled second house – the chances of a person being addicted to drug becomes more prominent. Drug addiction facts as per vedic astrology – First house of birth chart: The first house of the horoscope depicts about the nature, personality and physique of a native. Troubled and disturbed first house and its lord make a person quite vulnerable to bad things in his life including drug abuse. Drug addiction treatment – Positive role of Jupiter, as per vedic astrology: As a planet of divine grace and morals, the strength and nature of Jupiter in a horoscope plays a very vital role in vedic astrology solutions for drug abuse. A strong and positively placed Jupiter can dilute the negative influences of malefic and cruel planets over first, second and sixth houses. And, the native may get reasonable and fruitful help for drug addiction treatment. As per vedic astrology readings, the planets Rahu, Mars and Saturn are the real culprits in regard to the problem of drug abuse. These planets also obstruct in drug addiction rehab and the native may not get proper help for drug addiction treatment. If any of these planets is having negative relationship with first, second or sixth house of the horoscope; and at the same time the second house is also troubled – the chances of the person being addicted to drugs are very strong. Let’s have a look on some of the vedic astrology horoscopes, where the planets were indicating drug addiction. In this horoscope, the ascendant is Capricorn and occupied by its own lord Saturn and Ketu. Saturn is under mutual aspect with the Moon, Mars and Rahu placed in seventh house of the horoscope. The second house is tenanted by Venus, which is a positive planet for Capricorn Ascendant. However, as Saturn also rules over second house and is having relationship with Mars, Rahu and the Moon – the second house does become afflicted. The conjunction of Moon with Mars and Rahu is highly inauspicious in respect of the native’s capability of dealing with pressure situations. The sixth lord Mercury is not only debilitated but also combust, hence the overall health of the native becomes weak. The conjunction of Mercury with the Sun and Jupiter is another negative factor for the health of the native. It was during the Mahadasa of the Sun, when native got seriously addicted to drugs. However, the presence of Venus in the second house and strong Saturn as lord of second house do indicate strong hope of revival. The author met the native at a drug rehabilitation centre during the course of research in vedic astrology. The native, who was struggling to make a career in Mumbai film industry, was found to be strongly responding to the treatment. 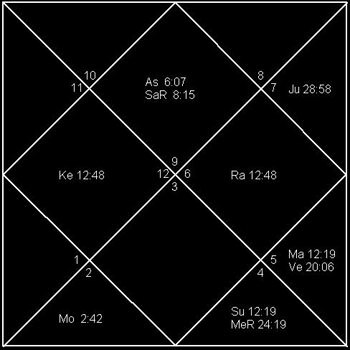 This is the horoscope of Sanjay Dutt, the famous bollywood celebrity. The second lord Saturn is strongly placed in the ascendant but is devoid of any other impact of planets. The placement of Saturn in the ascendant is good for Saturn, but it makes the ascendant afflicted as such Saturn is a negative and cruel planet for Sagittarius Ascendant. 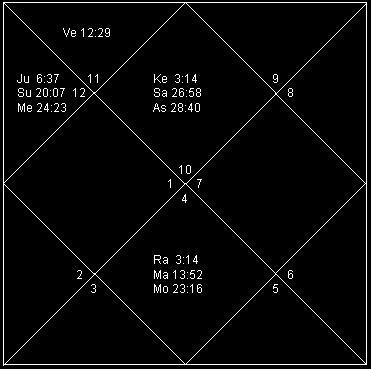 Jupiter, the ascendant lord is placed in eleventh house. The second house is under aspect of Rahu, Mercury and the Sun; of which the aspect of Rahu and Mercury is not auspicious. Being lord of seventh house, the Mercury is a Maraka planet. While Saturn is also a Maraka planet being lord of second house in the horoscope. The lord of sixth house Venus is strong and well placed in ninth house, while the sixth house is tenanted by eighth lord Moon. This placement of Moon is not very positive for significations of sixth house specifically health. It was during the Mahadasa of Rahu, when Sanjay Dutt got addicted to drugs. And, the influence of strong Jupiter and well placed sixth lord Venus helped him to get rid of his bad habit of abusing drugs. The placement of Venus in ninth house along with Mars was really too much helpful as such it was his father Shri Sunil Dutt, who took all the pain and responsibility to help Sanjay Dutt get rid of his drug addiction. This one is a very interesting horoscope and will be very useful in understanding the application of vedic astrology. The ascendant is Libra and occupied by its own lord Venus in conjunction with Mars. Being the lord of second and seventh houses, the Mars is a strong Maraka planet for Libra ascendant. And, its conjunction with Venus in the ascendant itself makes the horoscope quite weak and sensitive. The second house is occupied by Mercury and the Sun. The placement of Mercury is good while the impact of Sun’s placement in second house is not very auspicious. Saturn aspects this conjunction, and as a yoga-karaka planet for Libra ascendant, this aspect is positive. Therefore, both the ascendant and the second house are not clean and related with Mars. 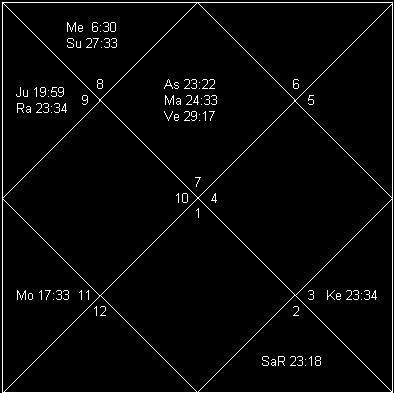 The sixth lord Jupiter is quite strong; but it is conjunct with another demon Rahu in third house. This conjunction of Rahu + Jupiter constitute the ferocious Guru-Chandala Yoga, known for giving all sorts of miseries and trouble to a native. During the mahadasa of Jupiter, the native was spoiled by one of his close cousin and started abusing drugs in his early college days. During the Mahadasa of Saturn and antardasa of afflicted Venus – the native started showing signs of being addicted. And, during the antardasa of afflicted Jupiter in Saturn’s Mahadasa – the native turned into absolute alcoholic person. The influence of Saturn and Mercury over second house, and reasonably strong placement of the Moon in the fifth house has allowed the native to have proper medical care and attention to get rid of the bad habit. But the operation of afflicted and malefic Jupiter’s antardasa has not allowed the complete rehabilitation. Vedic astrology readings can not only identify presence of any such yoga in the horoscope; but can also provide reasonable solution in the shape of astrology remedies including wearing of appropriate gemstone for strengthening of the horoscope. You may visit Birth Chart Astrology or email me at rajshekhar.sharma@gmail.com for seeking professional astrology advice and solution for your problems. Very nice article to read and spread. Thanks for your appreciation Dear SriKumar.